Is it time to rethink Wrigley's 7th inning stretch routine? 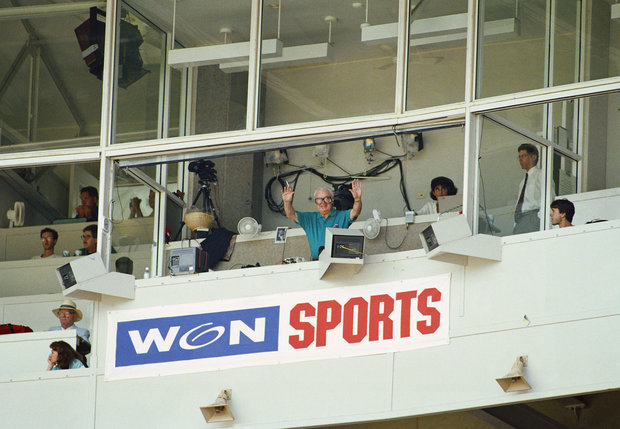 Should the Cubs think of retiring the celebrity 7th inning stretch made popular by Harry Carey? Harry Carey sings the 7th inning in 1994. Does anyone really care who is singing the 7th inning stretch at Wrigley anymore? The Cubs think the fans care. But I have yet to hear one person say they are going to Wrigley for the stretch. When Harry Caray sang "Take Me Out to the Ballgame" it was part of the experience at Clark and Addison. Now you get the occasional interesting celebrity, former player or coach to belt out the baseball tune. Sometimes a performance gets national attention. W(ho could forget Mike Ditka’s rendition in 2008?) In between, there are many uninteresting performers. The club says it is going to be more selective about who gets in the booth for the 81 home games. The singer will have connections to the city and be more familiar with the Cubs and the Harry Caray tradition. Will the possible candidates have to take a test, or maybe a Cubs 101 class? (Not because of the 101 losses). Can you imagine if you don&apos;t pass the class or fail the test? That would be full humiliation. But then again, some of the singing that has gone on in the booth can embarrass them too. What questions should a potential 7th inning stretch candidate answer? - Can you name the beer that Harry Caray endorsed? - Can you name the Cubs Opening Day starting line-up for either the 1969 or the 2008 teams? - Can you produce at least ten ticket stubs or scorecards for games you have attended? - If you don&apos;t have the items from #3, how about getting a sworn affidavit from family or from bars around Wrigley that you are indeed a fan? - Do you own at least one worn-out Cubs hat, shirt or jacket? - Do you proof of having a Chicago residency for more than a year? Of course, a shoo-in for a singing spot would be reciting all the present Cub players’ names backwards. That would fulfill the team’s allegiance requirement and prove someone really knows the Caray legacy. Sitting in the press box over the years, I&apos;ve seen the various people practice with organist Gary Pressy, autograph various Cubs items and then give a good-bad-or indifferent performance. It seems the indifference is the most bothersome, that is where a Cubs fan may take issue. The faithful are sitting in the stands, year after year, and they care. Cubs fans enjoyed Harry Caray doing the stretch because he related to them and he cared. So when anyone that has the opportunity to be in the spotlight for the 7th inning fans want them to care too. I wouldn’t mind if it was just a damn good singer that the crowd wants to hear. Hey, Justin Bieber will be in Chicago during a homestand in July. I’ll go for that. It would be nice if some of the usual Chicago celebrities would retire from this gig. (John Cusack and Jim Belushi are two that come to mind.) One of my favorite renditions happens during the final home game when the grounds crew sings. And how about giving some kids a chance? They don’t need to be in the booth for an interview. Just a few minutes to sing “Take Me Out to the Ballgame” and have a crowd join them. Maybe that doesn’t sell sponsorships, but it would make some new young fans. Isn’t that what baseball is supposed to be about? Maybe it is time to retire this tradition altogether. What do you think?